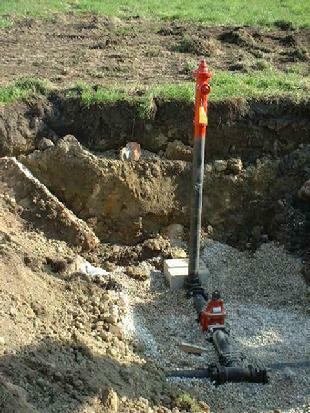 Lenox Construction Company is a family-owned, service-oriented company that specializes in all forms of pipe work. Our project manager Peter Filkins has had a 24 year career, working primarily with Petricca Construction as a Foreman Superintendent and has been involved in all phases of construction work ranging from small concrete work to major road construction. Throughout the years of work in the construction field Peter and his crew have acquired a strong and in-depth knowledge of all phases of pipe work. This past year, after acquiring the necessary tools and equipment, we have added piping and tapping to our list of services. Our goal is to support other companies and towns with their pipe projects. We have the capabilities to do the excavation work, but welcome customers to complete their own excavation work and we will perform all the pipe work and provide all the tools in order to complete the job. In addition to our working knowledge we have developed relationships with various town officials, engineers, and other construction companies. Lenox Construction Company is certified by the State Office of Minority and Women Business Assistance (SOMBWA). For information on our certification, please click here.